You, Professor Sir David, are my Vice-Chancellor. You are an educationist whom I deeply respect. You are a good friend of the Chinese people. And you are a pioneer in advancing China-UK educational cooperation. I would like to pay my highest tribute and extend my sincerest thanks to you, for the significant contribution you have made to closer educational cooperation and deeper friendship between China and Britain. This is my second visit to Nottingham in two months. In a matter of two months, the early autumn chill has turned the University into spectacular shades of gold. Looking at the paths formed on the thick carpet of autumn leaves as people walked by, I thought a lot and had three observations about paths that I would like to share with you. "There is no path until people take the first step and create one." The University of Nottingham, led by Professor Sir David, was the one who took the very first step in the field of educational exchanges between China and Britain. You have created the path of win-win cooperation. Of all the British universities, Nottingham is the first to set up a joint campus in China, the first to appoint a Chinese Chancellor and the first to set up a Confucius Institute in China. Your ties with China are so close that you have twined with Qinghua University, Zhejiang University and dozens of other Chinese universities. Here in Nottingham, you have established the Institute of Contemporary Chinese Studies, China Policy Institute and Confucius Institute. You have become an important window through which Britain and other western countries can study and understand China. Moreover, the Nottingham Confucius Institute was among the first to be awarded as a Model Confucius Institute. Of all your achievements, the most notable is the establishment of Ningbo Campus. This is a successful example of international cooperation. It was commended by President Xi Jinping, who said, "The founding of the University of Nottingham, Ningbo is the very first joint effort between Chinese and foreign higher learning institutions to pool their respective educational strengths. It creates a new model for a world-class and international education system in China." Thirteen years ago, there were only 254 students at the Ningbo campus. Today, Nottingham Ningbo is home to more than 7,300 students from over 70 countries and regions and has 12,000 alumni all over the world. Let me turn to my second observation. "Where there is a path, there are more people who will follow." The path of win-win cooperation is gaining popularity among educational institutions in both China and Britain. It is attracting more and more people. Education is undoubtedly the biggest highlight of the cultural and people-to-people exchanges between China and Britain. That's what I have learnt after seven years as Chinese Ambassador to the UK. First, Britain has the largest number of Chinese students in Europe. Second, Britain is home to more Confucius Institutes and Confucius Classrooms than any other European country. Third, British universities have more cooperation with China than their counterparts in Europe. It is especially worth noting that Britain was the first European country to set up High Level People-to-People Dialogue with China. Education is also one of the most frequent topics for my speeches. It is a most important field that I have been working on to promote mutually beneficial cooperation. At the Embassy, I am known as a "Pro-education Ambassador". 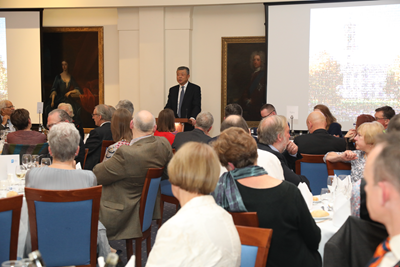 I would attribute that to the right path that we are taking in advancing China-UK educational cooperation. Right path leads to promising future. This is true for China-UK educational cooperation. This is also true for China's cause as a nation. The 19th Congress of the Chinese Communist Party, which concluded not long ago, was most significant for China because it points to the right path forward. This is a path of socialism with Chinese characteristics. It is a path led by the Communist Party of China. It is a path towards prosperity and happiness for the Chinese people. It is also a path towards win-win cooperation for the people of the world. This path is a contribution to man's exploration for a better social system. It offers a new option for other developing nations who are striving to achieve modernization. It brings new opportunities to China and the UK as our two countries build a successful "Golden Era". It adds momentum to building a community of shared future for mankind. Now let me share with you my third observation about paths. "A path will become broader when more people walk on it." Sir David, with the deep love you cherish for China, you have broadened the path you helped to create. Thanks to your contribution, the win-win cooperation between China and Britain has been expanded into more fields than just education. Ningbo and Nottingham have established twin city relationship. The two cities have increased exchanges and cooperation in the fields of education, business, culture and sports. More and more people have come to share the same ideal and work together. This path of win-win cooperation has become broad thoroughfare to success. While there is always an end to one's career, there is no end to what we can do and achieve for China-UK friendship. Sir David has dedicated a successful career to living up to the spirit of mutual respect, mutual learning, and win-win cooperation. You have found the key to heart-to-heart communications between the Chinese and British people. You have contributed to the building of China-UK "Golden Era". Retirement is a new beginning. There is always a better view further down the road. Sir David, we still need you in building a better future for China-UK relations. We still need your rich experience, extensive knowledge and great inspiration in order to get there. We still count on the wonderful team here at the University of Nottingham to actively engage in growing ties with China. It is my hope and belief that Nottingham will carry forward what Sir David has started and continue to contribute to the educational exchanges and cooperation and the closer friendship between China and Britain. I look forward to working with everyone present to contribute our part to China-UK relations and the China-UK "Golden Era". The University of Nottingham, founded in 1881, is a time-honored school and a member of the UK's Russell Group. Due to its close cooperation with China, over 2,000 Chinese students (including students from Hong Kong, Maucao and Taiwan) are currently studying at the University. In 2004, The University and Zhejiang Wanli University co-founded Nottingham Ningbo China which became the first Sino-foreign cooperative university approved by the Ministry of Education in China. In 2007, the University joined hands with Fudan University in establishing the Confucius Institute. Professor Sir David Greenaway, a famous British economist, was Vice-Chancellor of the Nottingham University from 2008 to 2017. During his term of office, he actively promoted the cooperation between the University of Nottingham and its partners in China. In 2012, he was awarded the title of "Ningbo Honorary Citizen". 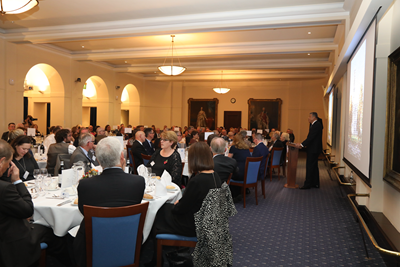 On November 9, the University of Nottingham hosted the Retirement Dinner for Sir David. Nearly 200 people, including guests from the local government, education, business, media sectors and alumni, attended the party. 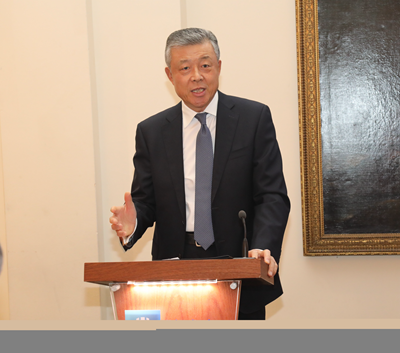 Ambassador Liu was invited to attend and delivered the above speech. Sir Andrew Witty, Chancellor of the University and a few others also spoke at the event and commended Sir David for his professional ethics and discipline, and thanked him for his commitment to the development and promotion of education with China. In the warm and friendly atmosphere, the guests spoke highly of the exchanges, mutual learning and win-win cooperation between China and Britain.